Accents kingdom introduces a stunning contemporary titanium necklace. The necklace itself is a powerful statement: Stylish, Sparkling, Slick and precisely engineered for perfection. 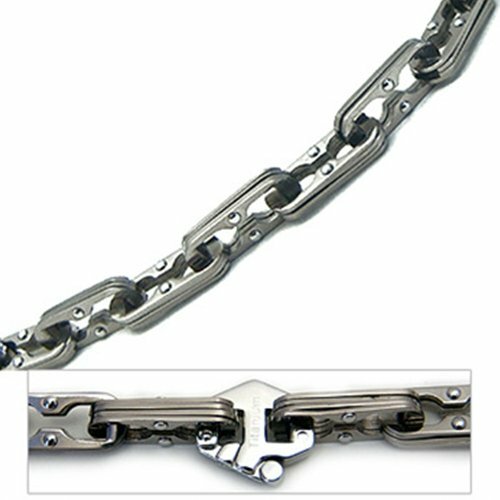 It features highly polished sophisticated 3D interconnecting box chian link design with fold over safety clasp. This truely unique necklace was precisely engineered from premium CP2 grade TITANIUM with TITANIUM stamped. One of the newest styles to our titanium necklace collection. It measures 20" in length and 6MM in width. Perfect Gift for Christmas, Valentine's Day, Birthday, Father's Day, Graduation Gift or just about any occasion. About Titanium: Titanium exhibits a high strength to weight ratio. Pure titanium is stronger than steel yet nearly 50% lighter. When added to various alloys, its hardness, toughness and tensile strength can be increased dramatically. Titanium is immune to corrosive attacks by saltwater and marine atmosphere, and exhibits exceptional resistance to a broad range of corrosive gases, acids and alkalis. Immune to microbiologically influenced corrosion, Titanium is physiologically inert and hypoallergenic.